Political Position: Conservative political activist, author and former ambassador to the U.N. during the Ronald Reagan administration. Keyes' Credentials: Although he has never successfully won a political race, Keyes has spent his entire adult life in the political arena. 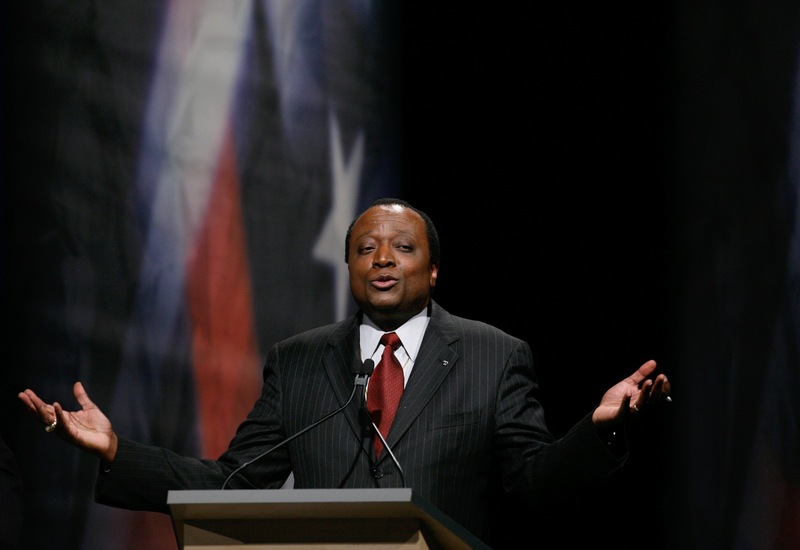 Following the completion of his doctorate in government affairs at Harvard University, Keyes served in the United States Department of State as a desk officer at foreign consulates. From there, Keyes served under the Reagan administration in various appointed positions from 1981-1987. In 1988, Keyes began his second political career, the pursuit for elected official. In 19 years, Keyes has ran for the U.S. Senate three times and sought the Republican nomination for president two times - three, counting the current primary. As a candidate in the 2007 Republican primaries, Keyes is noted more for his only daughter's recent coming out as a lesbian than his contention for a spot on the Republican ticket. Still, Keyes continues to voice his disdain for a political atmosphere he claims is overrun with "hot air admissions" from politicians who say one thing but do the opposite. To this end, Keyes has founded the political activism group called RenewAmerica which is a grassroots effort to return America back to the founding father's principles and ideals. An independent group, RenewAmerica pledges its allegiance to the U.S. Constitution and Declaration of Independence. Keyes remains unfettered by his lack of showing in the polls and feels that the real reason he is in the primaries is to raise the bar and heighten the moral standard that America was founded on and must find once again in order to survive. Education: Attended Cornell University after high school, but completed B.A., Harvard University, 1972; Ph.D., Harvard University, 1979. Experience: U.S. ambassador to the U.N. Economic and Social Council, 1983-1985; assistant secretary of state for International Organizations from 1985-1987; Republican nominee for U.S. Senate in Maryland, 1988 and 1992; sought the Republican Presidential nomination in 1996 and 2000; Republican nominee for U.S. Senate in Illinois, 2004.
Notable: As a child, Keyes moved frequently with his family due to his father's service in the Air Force and lived in Italy for a short time. Keyes is a third-degree Knight of Columbus in the Roman Catholic fraternal service organization and a trained opera singer. His wife is from India, which is where he met her while serving in the United States Department of State. Keyes on the Issues: A look at where Keyes stands on the issues. Nevada Contributions: Keyes' was not listed on the Nevada Contributions report. State by State Contributions: Keyes' was not listed on the State by State report. Keyes' Discussion Board: View Keyes' official campaign discussion board. YouTube Video: Keyes' answers to various questions at the Iowa "You Decide 2008" Republican debate. — Las Vegas Sun intern Jenna Kohler compiled this report.